Simple and super quick to make this tray bake is delicious served with warm custard. Follow a recipe; follow food safety & hygiene rules; tidy away; use a sieve; crack an egg; beat an egg; cream fat and sugar; scrape out a bowl with a spatula; divide mixture into tins; use measuring spoons and cups; use balance/digital scales; chop using bridge/claw safely. Baking tin (20 cm square) or foil tray, weighing scales, mixing bowl, measuring spoons, electric hand whisk, small bowl, sieve, metal spoon, knife, fork, chopping board, spatula, cooling rack. 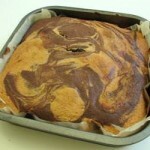 Grease and line the baking tin or foil tray. Cream the sugar and margarine together, ideally using an electric whisk until light and fluffy. Add the beaten egg, a little at a time, to the margarine and sugar. Fold the flour and baking powder into the mixture, a spoonful at a time. Core and chop the pear in to small pieces. Scatter pieces of pear into the lined cake tin. Spoon half of the plain cake mixture into the tin. Stir in the cocoa to the remaining cake mixture. 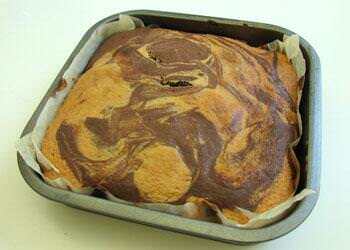 Spoon the chocolate mixture into the baking tin and swirl the two mixtures together to create a marble effect. Place in the oven and bake for 20 minutes, until golden brown and springy to the touch. 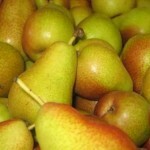 Pears are high in fibre and are packed with lots of different substances called phytochemicals. Phytochemicals can help protect our bodies against disease.